Tonight we are here because of the events that has taken place in the past months; Typhoon Haiyan (local name: “Yolanda”) swept through our country leaving in its wake death and destruction. In the days immediately after, my family did our best to give to the relief efforts through the Philippine Red Cross and World Vision. Afterwards we asked, “what more can we give?” On our way to planning a family photo exhibit, we decided to give away our photos in an online auction. So my son, Khalil, and daughter, Erika, plus two friends who joined early—Jay Laurito and Larry Monserate Piojo—raised over US$800.00 auctioning photos online. We were on our way to doing it again when other photographers offered to join. 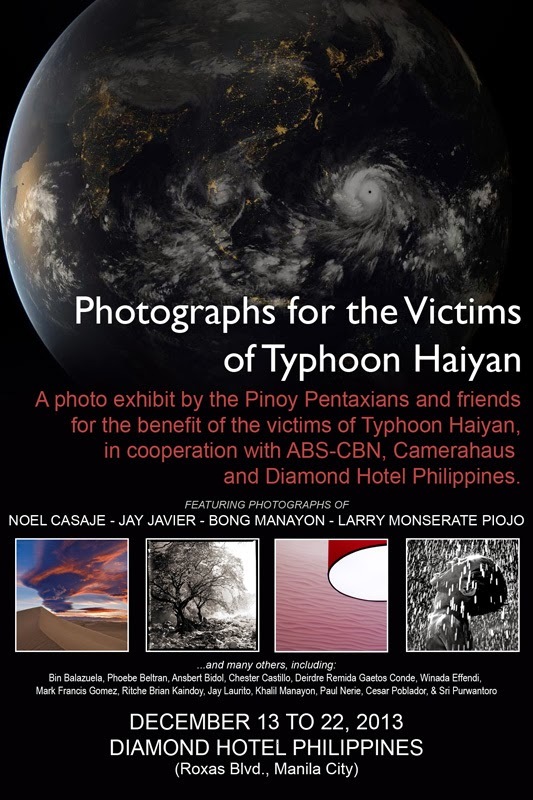 Ideas were thrown in and with Diamond Hotel Philippines offering to provide the venue and Camerahaus as a sponsor, we are now here opening an exhibit and hopefully sell more photographs for the benefit of the victims of Typhoon Haiyan (this time through ABS-CBN's Sagit Kapamilya). For me, sharing gives meaning to everything—including photography. Photography is a gift—a blessing. By saying it is a “blessing”, I am intentionally declaring something: for me photography is not a result of a fat salary or a high limit on my credit card to allow me to buy some expensive gear. On the contrary, it is a gift from someone and my choice of word declares that it is from God—as revealed through Jesus Christ. It is a blessing on three levels. The material blessing, the blessing of seeing and the blessing of what I will call, a heart. Which leads us to the third blessing: it brings us to a Roman Catholic tradition of the Sacred Heart of Jesus which is broken because of the pain of the world. That heart shows me the pain, the suffering, death and sorrow and asks me to tell its story. Tonight, by being here we chose to be part of that story. By giving of ourselves through these photographs, maybe—in the midst of the suffering and sorrow—perhaps maybe, we can give the story a happy ending.